WHAT’s NEW at Draxen Farms in 2018! DUCKS ~ We have new Runner Ducks with an A and B Courses set up for AKC and AHBA trial training or just for fun! This is a great way to learn how our dogs and our pressure affects the movement of stock. Your dog will be on a long line/string for safety, this is also a great way to guide them through the course with control. Train for the New AKC FARM DOG CERTIFICATION! This new AKC program is open to ALL dogs! This program provides an opportunity for all dogs to apply their basic training in a novel farm environment. There are 12 test items to practice which builds confidence and trainability. We will offer practice training sessions for upcoming AKC Events in the area. To gain your title, your dog must pass all 12 test items under two different judges for your Farm Dog Certification Title! Draxen Farms is an ALL HERDING BREED training facility located in the Central Southeast region of Florida. This makes us a short 1-3 hour road trip for sheep herding students throughout the state. Pack your dog(s) and your cooler and plan to spend the day out in the country with us! Many folks come to train from Naples on the West Coast, as well as our neighbors to the South in West Palm, Ft. Lauderdale and Miami. See our map and mileage on our Contact Page. We are located just a few miles West of I-95 and the Turnpike. ​We offer a relaxed, family-friendly training environment for ALL Herding Breeds. Lessons are by appointment only held on Saturdays, Sundays and Mondays. We offer all levels of instruction from first timers coming out to instinct test their dogs to higher level training fields and sheep for more experienced dog-handler teams. We offer two Round Pens for beginners with very wooly experienced “School Sheep”. School Sheep are very used to being around excited dogs, and easily stay together with the handler for more settled training and instruction. A large A Course & B Course for sheep if you are preparing for upcoming trials using a variety of sheep based on you and your dog’s training level. Multiple fresh water tubs around the property that are changed regularly throughout the day. 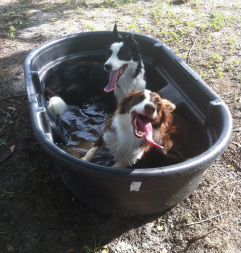 WE KNOW it’s critically important for our dogs to get in the tubs and cool down after training. 8 newly constructed SHADED KENNEL RUNS with flooring for your dog to cool down and power down in between his turn and 3 additional smaller kennel runs in the grass. They are first come first serve to help keep the dogs cooler than in crates in your vehicle.